As diversity increasingly becomes a sticking point, fashion brands are opting to partner with celebrities from different ethnic backgrounds, age demographics and body types. Of all these thorny issues, age has been a particularly polarising trend. On one hand, bolstered by the ‘Advanced Style’ movement, older women are seeing greater representation in fashion ads – just look at Céline’s 2015 campaign featuring 83-year-old Joan Didion – but the other side of the coin is the growth of Generation Z model super-influencers like Bella Hadid and Taylor Hill. Boasting sizeable social media audiences, these models are well-placed to provide value for brands hoping to increase their exposure among young consumers. 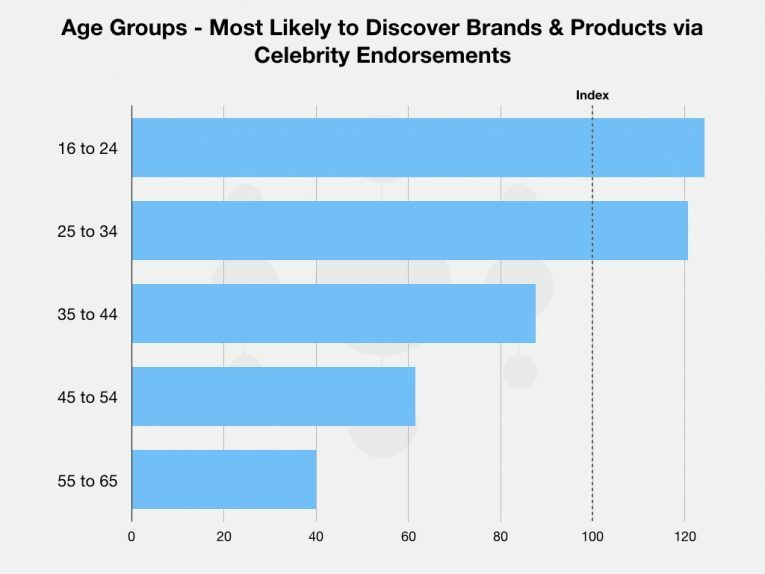 Data from Global Web Index reveals that 16-24 year olds are 24% more likely than average to discover new brands and products following a celebrity endorsement, more than any other age group. Brands working with these Gen Z celebrities can also bypass some of the common problems they face reaching consumers online as over a third of Generation Z actively use social media to follow celebrities or celebrity news. And unlike some celebrities who need to be strong-armed into promoting themselves and their brand partners on social media, these model influencers enthusiastically give fans a glimpse into their lives and social circles, usually featuring other influencers behind-the-scenes. This lends greater authenticity to their promotional efforts. In addition to making Generation Z stars the faces of their products, some brands are seeking deeper collaborations and lending them the keys to the design studio too.Tommy Hilfiger’s 2016-17 Tommy x Gigi collections make particularly successful examples of how a brand can expand the global ambassador role. Co-designed with Gigi Hadid, the collection’s New York Fashion Week debut led to a 900% uplift in traffic to tommy.com. A further 70% of visitors during this time were new to the site, according to WWD. More recently, Karl Lagerfeld announced that Kaia Gerber will be co-designing a ready-to-wear and accessories line for his eponymous brand. The 16-year-old daughter of Cindy Crawford has made a rapid ascent into the public consciousness, prompting the Guardian to ask ‘Why is Kaia Gerber suddenly the centre of the fashion universe?’. For young consumers (and the brands desperate to reach them), part of Gerber’s appeal lies in her use of Instagram, where she has 2.8M followers. 41% of 16-24 year olds use the app at least daily, with almost a quarter seeking out celebrity Instagram accounts like Gerber’s. In terms of sentiment from earned media, nearly half of all positive conversations around Gerber appeared on Instagram, underlining its role as a conduit of advocacy compared to Twitter’s more divisive ecosystem. While sentiment around the Karl Lagerfeld x Kaia Gerber collaboration was largely positive, there was still scepticism from some quarters about Gerber’s age and experience, as well as expected accusations of nepotism. Twitter drove 39% of this negative discussion. Fashion magazine I-D (@i-D) was the source of much of this, prompting an outcry from fashion students and creatives who make up more than half of its Twitter follower base, according to data from Brandwatch Audiences. In Gerber’s case, her background provides unique benefits as well as challenges – being born into fashion royalty attracts immediate interest from the media, after all – but purists may be more difficult to convince. Lagerfeld is an old hand at partnering with emerging young talents, many of whom come from famous families. As Creative Director of Chanel, he selected the then 16-year-old Lily-Rose Depp to be the face of Chanel No.5 L’Eau, the more youthful counterpart to the brand’s iconic No.5 fragrance. Like Tommy Hilfiger, he also stoked interest in live fashion events – for instance giving Lily-Rose Depp, Kendall Jenner and Bella Hadid starring roles in Chanel’s Spring 2017 Couture show. It’s no surprise then that Chanel fares well for sales among 16-24 year old women. According to GWI, 13% of this audience have purchased Chanel products in the past 1-2 years, the top ranking luxury fashion brand in the sample. 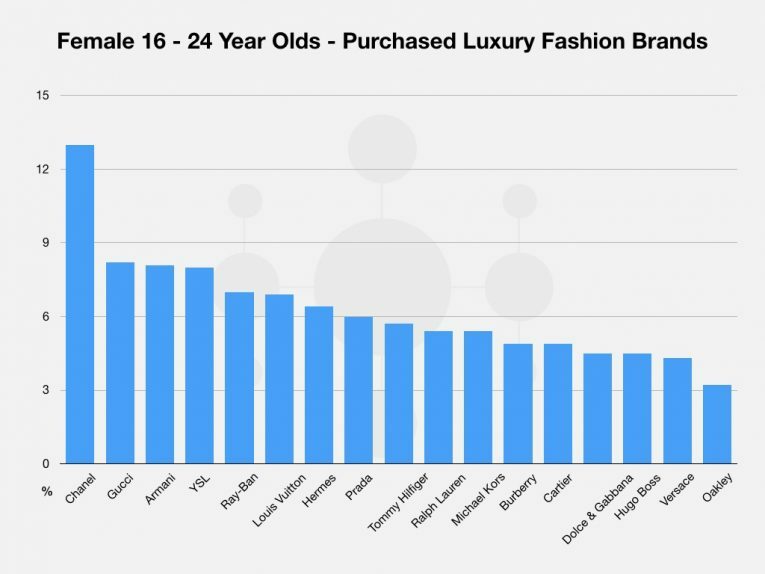 Of course, not all young people can spend their cash on designer goods, but Chanel also has cache among those who can’t afford brand new items: the RealReal State of Luxury Resale report ranked the retailer in the top three brands bought on consignment by Gen Z consumers during 2017. Generation Z is swiftly catching up with Millennials in terms of spending power, and will represent 40% of the world’s consumers by 2020. Even today, GWI data tells us that the proportion of women aged 16-24 who have bought clothing in the past month is just three percentage points less than the 25-34 cohort, and slightly more 16-24 year olds plan on purchasing jewellery in the next six months compared to Millennials. With an eye to this data, fashion brands should make moves to engage this critical consumer audience now. Continuing the theme of social media savvy Gen Z models, there’s a host of emerging faces to choose from, including Burberry beauty ambassador Iris Law and Lourdes Leon, who Stella McCartney selected to launch her POP fragrance last year. For brands that require a more established social media presence, Kaia Gerber drove 7% of all Karl Lagerfeld conversation online during January 2018: not bad for a model just starting out. Whichever way the winds of fashion blow by 2020, partnering with engaging and authentic individuals will always remain on trend.